When we think of the wine regions of the United States we immediately think of California, and rightly so since it is so dominant. But places such as Oregon, New York, Washington state, and others would disagree. Oregon is a newcomer to wine production. In the 1970s it had just a few wineries, but now it has several hundred. The Willamette Valley, near Portland, is the most important winemaking region of Oregon. Here Pinot Noir is king. The cool climate is ideally suited for growing these wine grapes. 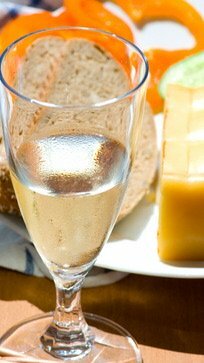 Still, there are some wineries producing Chardonnays, Rieslings, and Pinot Gris. The Umpqua Valley, near the California border, produces Pinot Noir, as well as Chardonnay, Riesling , and Cabernet Sauvignon. This area is home to the first winery in Oregon. The Rogue River Valley turns out Cabernet Sauvignon and Merlot wines. The state of Washington has its main wine producing regions on the east side of the Cascade mountains. The climate there brings hot summers and cold winters. The largest wine producing area in the state is the Columbia Valley. The state is well known for its Merlots, but Syrah is becoming quite important. The Yakima Valley is also a very important wine producing area. It has as many, if not more, wineries than the Columbia Valley. Washington has some wineries located on the coast, near Puget Sound. They make mostly Riesling and Gewürztraminer. New York has been producing wine since the nineteenth century, but it is not yet a very well known wine region. Its most important wine producing area is the Finger Lakes region, where the lakes help to mitigate the cold climate. The area turns out Chardonnays, Rieslings, and the well known Kosher wine Manischewitz, made from Concord grapes. Long Island is a newcomer, making Cabernets; but the area is being planted with Merlot and Cabernet Franc as well. California seems like a magical place. The climate is great, the soil is fertile, and people are innovative and open to new ideas. This is a perfect recipe for good wine. Some say that the weather is too good, and the soil too fertile. Hey, grapes thrive in bad soil and hard conditions, where in California could you find these conditions? And yet! California has been producing wine since the Franciscan friars established the Missions in the 1700s; each one had its own vineyard, planted with grapes brought from Mexico. By the 1880s wine production had grown throughout the state, but then the vines were ravaged by phylloxera, and it almost killed the industry. Wine production in the state had many ups and downs. The latest chapter, and the success story of winemaking, began in earnest in the 1960s. It isn't just Napa and Sonoma Valleys, it is almost every corner of the state. From Mendocino county in the northern part of the state, to Temecula and Fallbrook near San Diego and the Mexican border. The key California wine regions are: Mendocino, and Lake County, which are the farthest north. The Sierra Foothills, with Amador County and El Dorado County. Then we have the famous Napa and Sonoma counties, with the nearby Russian River and Carneros areas. Then comes the Livermore valley on the east side of San Francisco bay. Central California wine regions are: Santa Clara County, once a mighty wine producing area, but now it has been taken over by the electronics industry; it is best known as Silicone Valley now. Wine is also produced in the Santa Cruz Mountains, in Monterey County, Carmel Valley, and Chalone. In the central coast area, north of Los Angeles, you have: Paso Robles, Edna Valley, Arroyo Grande, Santa Maria Valley, Santa Barbara, and Santa Inez. 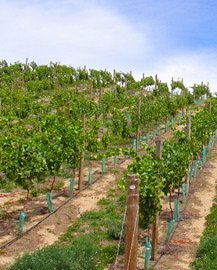 In the south there is the area near San Diego, with the towns of Temecula, Ramona, and Fallbrook producing very good wines. Every kind of wine is produced in the state. There are no dominant wines of California. Because the weather and topography vary from coast, to desert, to mountain, to valley; just about everything kind of wine grape is grown, and just about any kind of fruit and vegetable grows. It truly is a land of plenty. This variety leads to creativity, to great wines being made, and to being paired with wonderful foods. Though Relative Newcomers to Winemaking, The Wine Regions of the United States Offer Great Variety and Creativity.